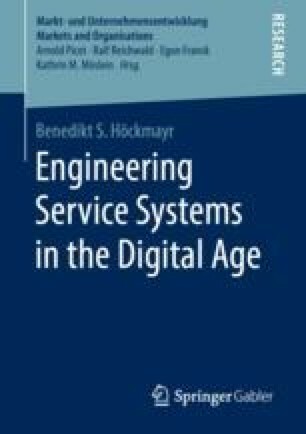 The objective of this research was to answer the research question of how design knowledge for engineering service systems in the digital age can be developed toward a consistent body of design knowledge. In order to address the underlying multifaceted nature of this overarching research question, the overall outline of the dissertation was attuned to the search process that ultimately lead to the emergence of a useful solution (Hevner et al., 2004; Simon, 1996). Against this backdrop, the constituents of this dissertation were comprised of six parts with each of them addressing a distinct task in the context of the overall research objective.